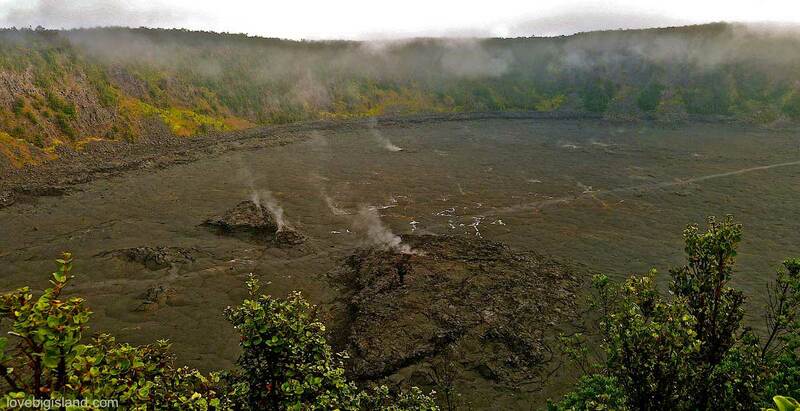 The Kīlauea volcano is the most active volcano in the Hawaii Volcanoes National Park. It is one of the most active volcanoes in the world and is seen by millions of tourists each year. 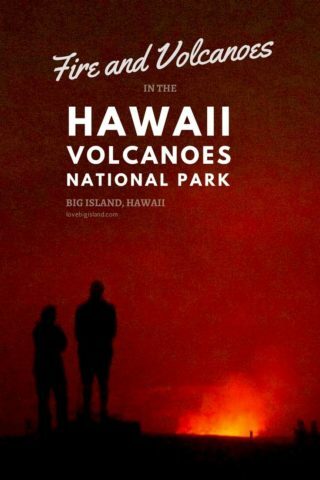 This makes it the most visited attraction in Hawaii and the most visited volcano in the world. Accommodations in the park: camping and the Volcano House. If you are looking for more than a day trip to see the volcanoes, set up camp in Volcano Village. This small village lies in the middle of lush rainforest only 5 minutes from the park entrance and has some great value vacation rentals! You can visit the Hawaii Volcanoes National Park at night to see the glow over the halema’uma’u crater at the jaggar mnuseum. The big island consists in total of five separate volcanoes: the Kohala, Mauna Kea, Hualālai, Mauna Loa and Kilauea volcano. Mauna Kea measures 13,796 feet and is the tallest mountain in the state and the tallest sea mountain in the world. Mauna Loa is the largest volcano on Earth in terms of volume and area covered. The Hawaii Volcanoes National Park encompasses two of these volcanoes: Mauna Loa and Kīlauea. Despite all of these impressive figures Kīlauea is the most famous of the Hawaiian volcanoes, and rightly so! It is the youngest and most active of the five volcanoes and has recently been erupting continuously between 1983 and 2018. It is the Kilauea volcano whose lava you can often see flowing into the ocean and whose immense Halema’uma’u crater crowns the park grounds. You can read more in-depth information about the Kilauea volcano on the USGS website. Read more about the five volcanoes on the Big Island in our blog. After having been closed for over 4 months during the Lower East Rift Zone eruption in Puna the Hawaii Volcanoes National Park has opened its gates again on September 22, 2018. The park infrastructure suffered lots of damage during the eruption including building damage, rock falls, deep cracks in roads and trails, and numerous breaks to water and sewer lines. Right now only parts of the park are opened to the public while more parts are expected to open as repairs get completed. 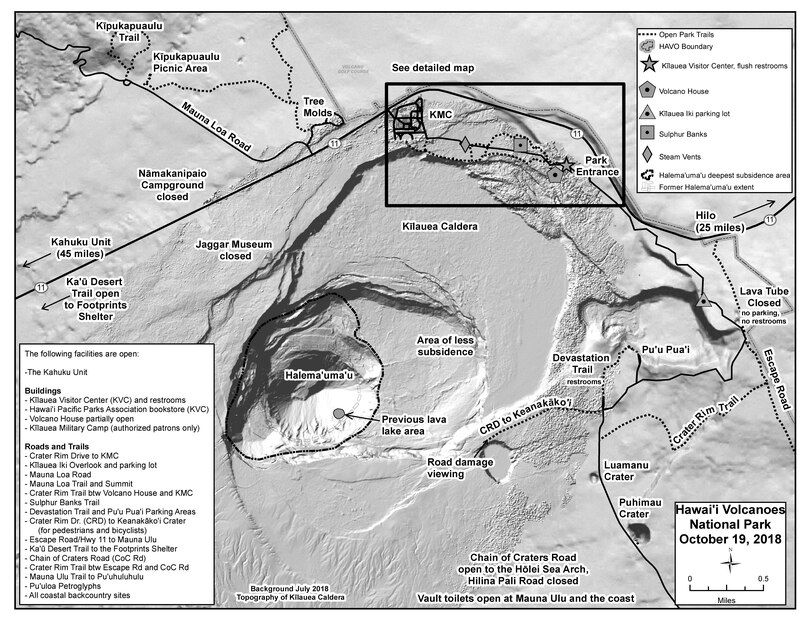 Accessible parts of the Hawai‘i Volcanoes National Park as of October 19, 2018. Source. Many parts of the park are still being repaired and sometimes new issues are found that require previously opened areas to close again. The list below is updated from the “closed areas” page on the USGS website but may not be up to date as conditions can change on a daily basis. We advice that your first visit in the park is to the visitor center, where you can talk with rangers who can update you on the most current conditions and who can also give you tailored recommendations based on your preferences and the weather. The following parts of the park are still under repair. For the latest updates on the accessible parts of the park see the “closed areas” page on the Hawaii Volcanoes National Park website. 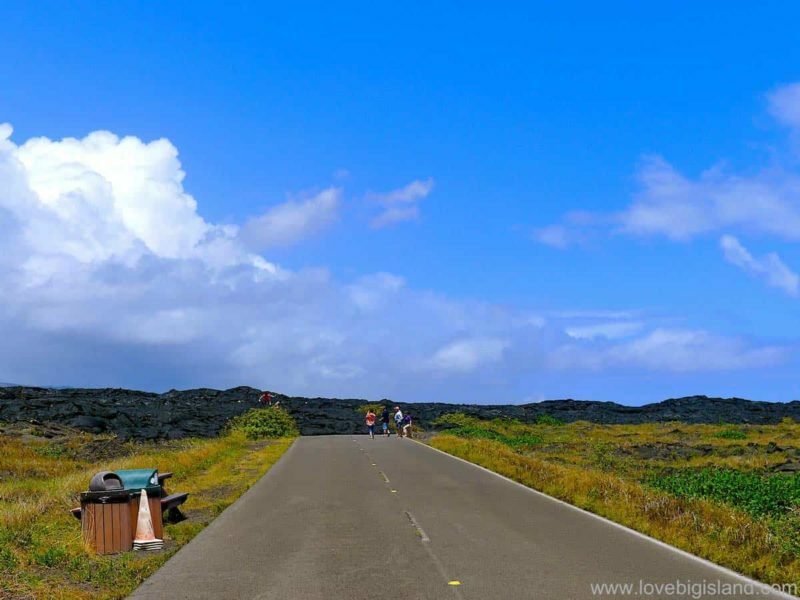 It is easy to spend multiple days in the Hawaii Volcanoes National Park without getting bored. There are many short and long hikes in the park and plenty of interesting spots you can easily reach by car. The park also organizes a very interesting weekly lecture series called “After Dark in the Park“. Park attractions include the following 11 highlights, but please remember that here is far more in the park that deserves your attention. Below the list you can watch a video shows four of our seven favorite things to do in the park and find more information about camping in the park and seeing lava. is open daily from 9:00 a.m. to 5:00 p.m. Ranger talks and guided tours can be scheduled here, and there plays a 25-minute film to introduce you to the park. Pick up a map, learn about the hikes in the park, and get the latest eruption updates here. Opening hours are subject to change, find the current hours at the national park website. At the moment (September 2018) the museum is closed and the lava has drained from the lava lake. It is not clear yet whether the museum will open again due to structural damage to the building caused by earthquakes. is our favorite short hike on the Big Island (more about this hike). It takes you down into the Kilauea’iki crater across the crater floor which was formed only 50 years ago, and up again to the parking lot. Part of this trail, the section of trail leading to and on Byron’s Ledge, is badly damaged and remains closed. Park at Kīlauea Iki Overlook and hike Crater Rim Trail towards the closed lava tube parking lot to pick up the trail. 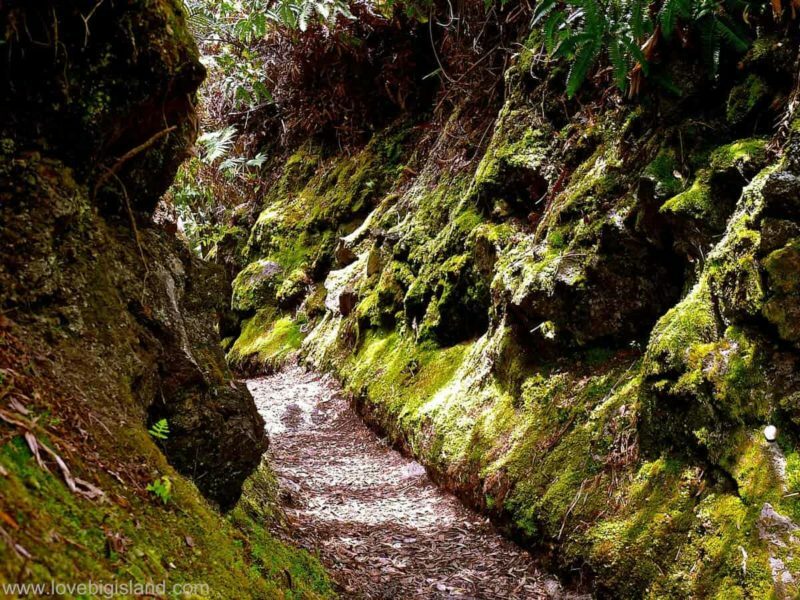 Hike in and hike out the same way back to your car for a 2.4-mile one-way trek. The Thurston lava tube is an easily accessible and very interesting lava tube close to the Kilauea’iki parking lot. A 20 minute (1/3 mile) walk through a tree fern forest and a illuminated cave-like lava tube takes you from the main road through the Thurston Lava Tube and back to the parking lot. During daytime hours there the lava tube is illuminated, but between 8 p.m. and 10 a.m. there will be no lights on in the cave. The cave will remain open overnight for visitors that want to experience a pitch black lava tube :). 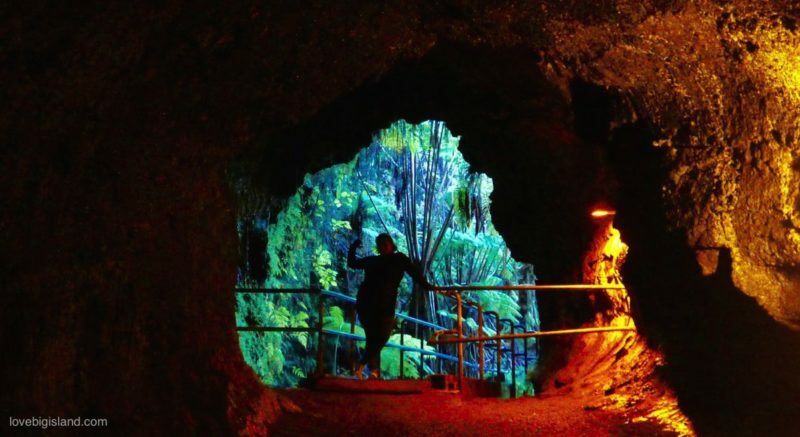 Visitors must carry their own light source if planning to explore the lava tube in its dark, natural state before 10 a.m. or after 8 p.m. Park rangers recommend head lamps and flashlights; cell phones are not recommended as the only light source. takes you from the park entrance past many scenic points and volcanic craters all the way down to the ocean where the road finally disappears under a fresh sheet of lava (description of the crater rim drive tour on the national park website). The chain of craters road is one of our favorite scenic drives of the Big Island. The ranger station on the Chain of Craters Road is open daily from 10 am to 9 pm. There are more than 10 day hikes possible inside the park for which you can find a description at the park website. The 100+ miles of hiking trails take you through old lava tubes and lush rainforest, and over old and new, still fuming, lava flows. The park also organizes daily ranger-led hikes. 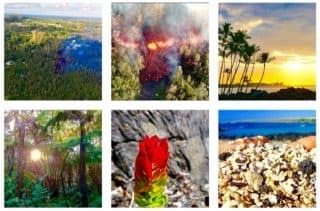 If you are looking for longer and more challenging hikes a good place to start is the Big Island Hikes website (the hikes are listed at the bottom of the page). is located directly next to the Kilauea Visitor Center and is open from 9:00 a.m to 5:00 p.m. daily. More info on the Volcano Art Center here. The sulphur banks are an impressive reminder of the volcanic activity in the park because of the volcanic gases that seep out of the ground along with groundwater steam. 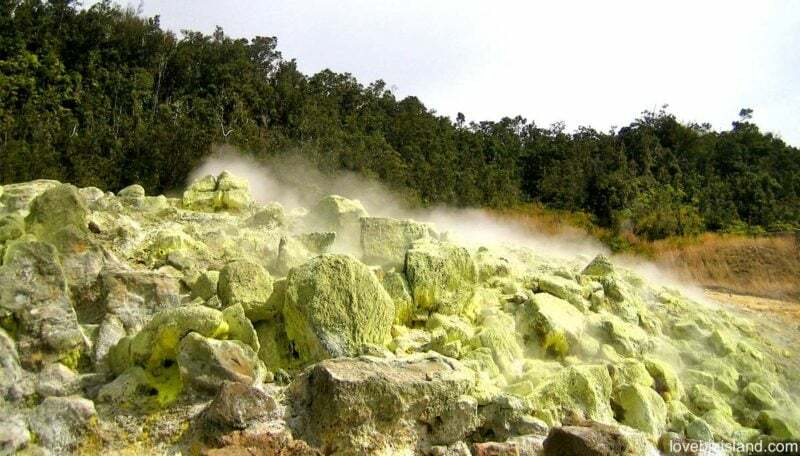 It is an unusual spot with steaming cracks, colorful mineral deposits and the smell of sulfur (think: rotting eggs) in the air. The Mauna Loa Strip Road is an 11.2 mile (one way) road which takes you to the Mauna Loa lookout point at an elevation of 6,662 feet (2031 meters). During the drive up (and down again) you pass many impressive volcanic features and get to see some sweeping views of the Ka’u district and the Kilauea volcano. This is one of our favorite local scenic drives, and you can read more about it in our article on the best scenic drives on the Big Island. Children up to 12 years old can become junior rangers and receive a junior ranger badge. To become a junior ranger the kids have to complete a couple of activities while in the park. This is a free, fun and educational activity and we highly recommend it if you bring any children. There are programs for kids aged 7-12, and for those of age 6 and below. More information including junior ranger handbooks which you can print out at home can be found at the be a junior ranger website. This is a section of the Crater Rim Drive near the Devastation Trail parking lot that is open to hikers only. It offers an easily accessible, 0.7 mile, hike to the Keanakāko’i Crater, and also has two overlook points that provide panoramic views of Halemaʻumaʻu Crater and Mauna Loa. 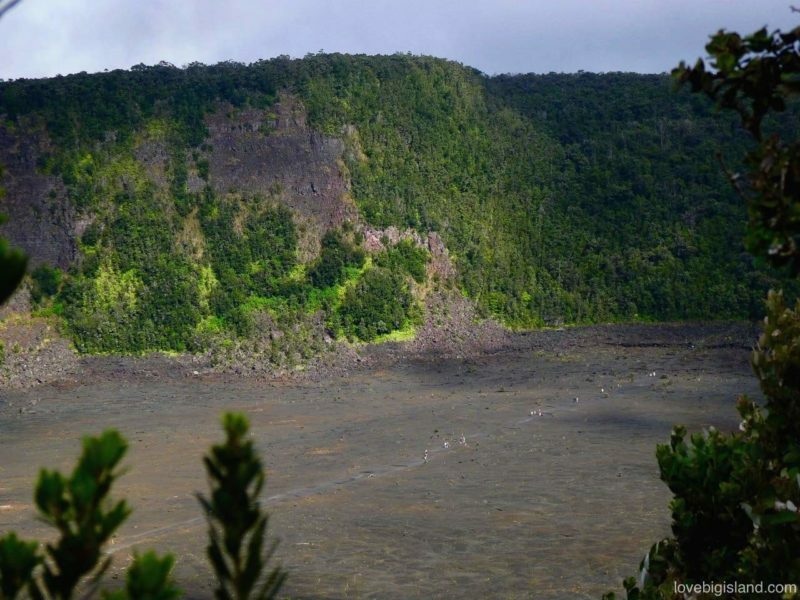 These two points are the main selling point of this small hike in 2019, as this is without doubt the best place the see the dramatically enlarged Halema’uma’u crater. Conditions for lava viewing (e.g., lava flowing into the ocean, accessibility of the lava flow) are ever changing. Please see our lava viewing guide for Hawaii for up-to-date information on where and how to see lava. 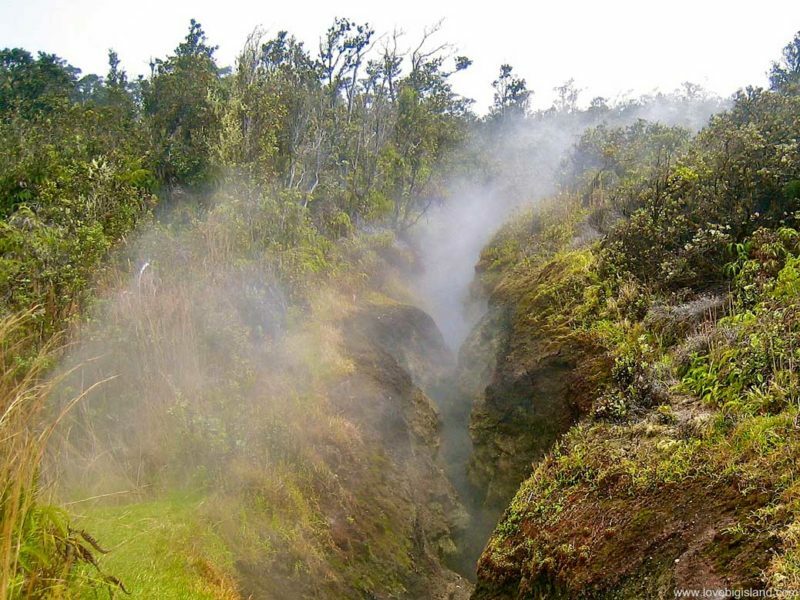 See more pictures of our favorite places and activities in the Hawaii Volcanoes National Park. Part of the Chain of Craters road. As a bonus the video also has some mesmerizing footage of lava entering the ocean in 2017. There is so much to do in the park that many people choose to spend at least one night in (or close to) the park. 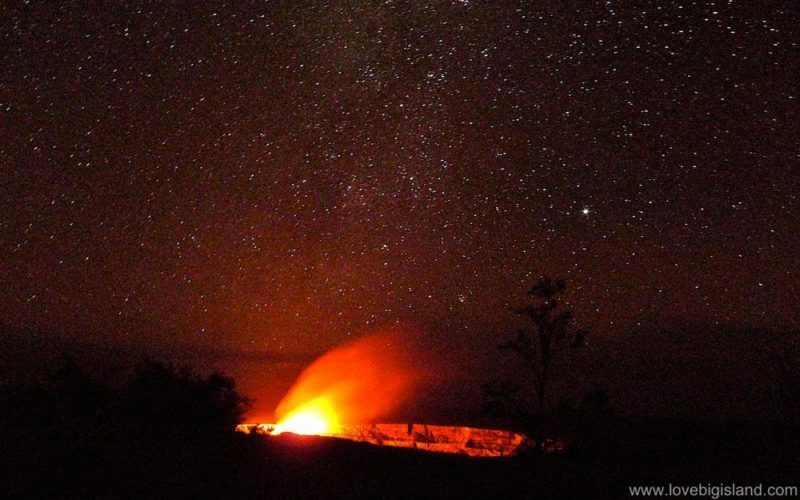 There are two campsites in the park, as well as a hotel whose lounge offers stunning views of the Halema’uma’u crater. Overnight camping is possible in the park on two separate campgrounds, one of which also has tent rentals and cabins available. The park hotel combines a great location with average and somewhat pricey rooms and is called the Volcano House (website) . You can also choose to stay in the very nearby (a few minutes from the park entrance) Volcano village if camping in the park or staying in the Volcano House hotel doesn’t appeal to you. The village is located in the same lush rainforest as the park and hosts many charming and affordable vacation rental houses. Finally, if you are an active service member or have served in the US military you can also stay in the Kilauea Military Center (KMC, website). The KMC is located inside the park and offers 90 guest cottages and apartments with one, two, or three bedrooms, and a 110-bed dormitory. 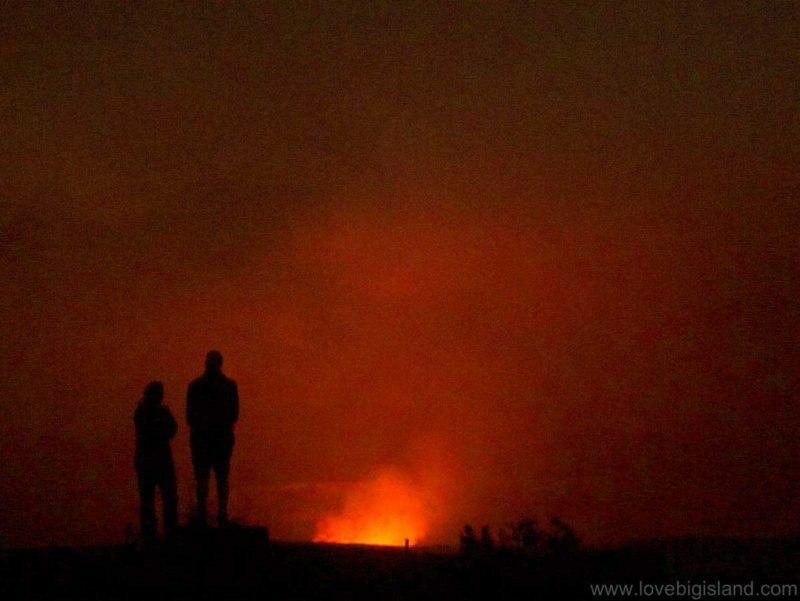 The Hawai’i Volcanoes National Park is open 24 hours a day, every day of the year. The Kilauea Visitor Center is located on Crater Rim Drive off of Highway 11 between the 28 and 29 mile marker south of Hilo. The visitor center is opened daily between 9:00 am and 5:00 pm. The gate of the park stays open outside the official opening hours so don’t worry about staying late or arriving early (to avoid most other visitors). General admission is $25.00 per private non-commercial vehicle or $12.00 for pedestrians or bicyclists. Keep the receipt, because it will allow you seven days entrance to the National Park (2019). The Haleakala National Park on Maui. The pass admits the pass owner and/or spouse along with accompanying persons in a single, private, non-commercial vehicle. When your entry is by other means (by bike, on foot, with the Hele-On bus, etc.) it covers the purchaser and accompanying immediate family (spouse, children, and parents). The pass is not refundable or transferable. Below you can find the 2019 map of the (most popular) summit area of the Hawaii Volcanoes National Park. You can find larger maps of the complete park area and the island at the maps section of the national park website.